The Archaeological Society at Athens undertakes excavations under the direction of Petros Pervanoglou, west of the Hills of the Pnyx and of the Muses (Philopappos). The works last 40 days and bring into light more than 100 graves. At the same time, the Act 690/1861 (Art. 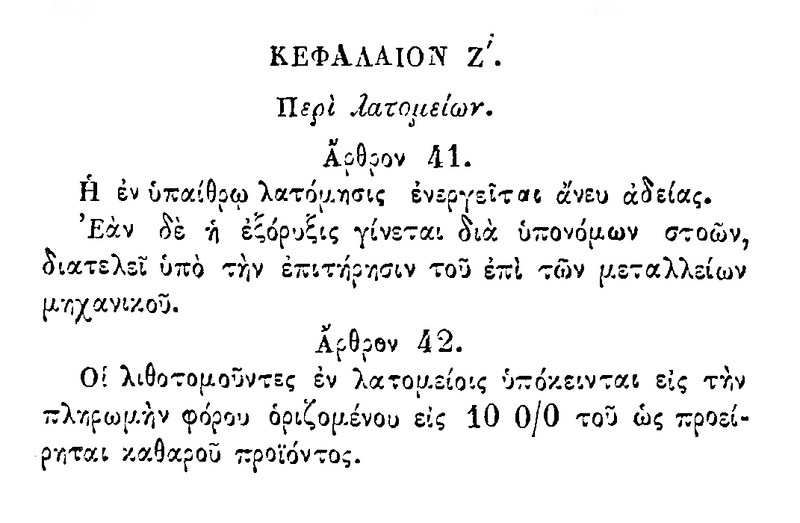 41) is adopted, allowing for the unrestricted operation of quarries outside the inhabited area of the city, which intensified the commercial exploitation of the quarried product on the rocky grounds of Athens, such as Lycavettos, the three Western Hills, Kolonos Hippios and the hill of Strefi. Almost every effort on the part of Efstratiadis, the General Ephorate of Antiquities, to control the quarries proves unfruitful. The judicial authorities favour repeatedly the quarriers because the locations from which the sought-after stones are being extracted remain private properties. Pervanoglou 1862; Petrakos 1987, 43; Calligas 1996, 1–5; Theocharaki, Costaki and Papaefthymiou 2018, 309–319. The Act 690/1861 was the triggering cause for the rampant quarrying at the Western Hills of Athens, which compromised the antiquities’ safety.